Swansea Council has become embroiled in a major diplomatic incident after using an ex-SAS cleaning squad to erase graffiti from the side door of Taibach RFC clubhouse. 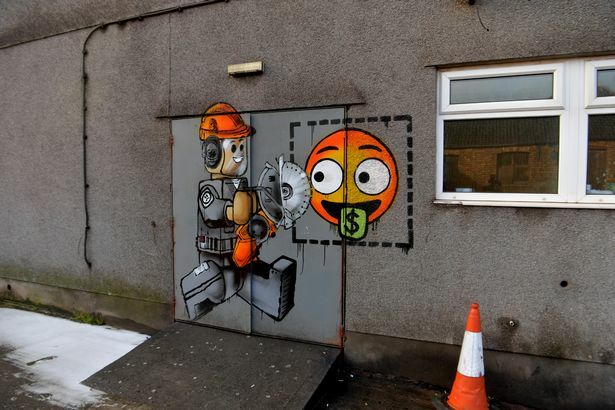 Flushed with success after power washing a £300,000 Banksy off an attractively displayed concrete block in the centre of their world famous ‘Prince of Wales Roadworks’ the council decided to act unilaterally and launched an incursion into neighbouring Neath Port Talbot. Overnight they cleaned off the work of artist Ame72 who also does that sort of thing. A Swansea council spokesman said, “Down with this sort of thing”. An emergency UN security council meeting was convened to investigate the incident. They immediately imposed a travel ban on any Swansea residents wishing to go into, over or under Neath Port Talbot. Member of Parliament for Aberavon Stephen Kinnock demanded air strikes and a UN peacekeeping force was deployed. At 7:25 PM on Friday the 8th of February drones bought from the middle aisle in Lidl used tomahawk missiles to destroy all roads in and out of Swansea resulting in a 50% increase in traffic flow at peak times. As of 8:00 PM a state of war was declared between the unitary authorities of Swansea and Neath Port Talbot. At 8:05 PM, 672 Swansea workers at the Amazon fulfillment centre in Neath Port Talbot applied to Jeff Bezos for asylum and threatened to close down sector 7G if their demands were not met. The ex-SAS cleaning squad waived their right to anonymity to make a statement to the world’s press. Anyway, I saw a gap in the market and soon I started cleaning up after all sorts of murderers. Not just murderers, there’s any number of hard-core cleaning jobs to be done in hard to reach places where you need to be in and out quickly and you’re not worried about your carbon footprint. When Swansea council approached me to get rid of the graffiti in Port Talbot I said yes. I was a bit concerned when they insisted we do it in the dead of night and offered to helicopter us in and out but I don’t do politics and a job’s a job. Now they want me to assassinate the leader of Neath Port Talbot council with some Novichok. I’m not saying I’m not, not going to not do it but it will cost extra. You know, for gloves and that. Any questions?